The Yankees lost the the Tampa Bay Rays 2-1 on Tuesday night for their fourth loss in a row. It was also their eighth loss in their past 10 games. Three out of their last four losses have been by one run. There were only two highlights offensively for the Yankees. Derek Jeter’s double in the fourth (534) tied him with Lou Gehrig for most doubles in franchise history. Jeter is also currently second in runs scored, first in hits and first in steals in the 101-year history of the franchise being known as the Yankees. Also in the fourth inning, with Jeter on third after Jacoby Ellsbury’s single, Jeter scored after Ellsbury’s stolen base because of an error by shortstop Ben Zobrist. They were in position to score more runs in the inning but Carlos Beltran flied out and Alfonso Soriano struck out after Ellsbury stole second off of David Price. Hiroki Kuroda had his best start of the season as he pitched eight innings for the first time after allowing only two earned runs, one walk and striking out seven. Kuroda allowed nine hits, but the damage was limited as a result of only allowing two extra-base hits. The first run that he allowed came off of a Logan Forsythe single in the fourth. The game-winning run for the Rays came off of a James Loney homer to right center in the sixth. Loney has enjoyed hitting against Yankees pitching this season and in previous seasons as .441 average against the Yankees this season, and he had a .341 average against them from 2011 to 2013. Kuroda should have been able to get his sixth win of the season, but the offense was only 1-9 with runners in scoring position. Mark Teixeira, Beltran and Soriano were all 0-2 with runners in scoring position. Brian Roberts was 0-4 and is hitting only .125 in his last six games. He is not adding much at all to the offense right now, which means that it would make sense to bring up the impressive Rob Refsnyder from Triple-A Scranton. He could improve the offense in a similar way that Robinson Cano did in 2005. Soriano, who is now playing part-time, has also not been giving the Yankees any average or power on offense since he has one hit in his last 12 at-bats and has combined for zero homers and three RBIs in the last 10 games that he has appeared in. Brian Cashman needs to add another bat and another starter before the trade deadline. The Yankees will play the final game of their series against Tampa Bay at 1:05 p.m. on Wednesday. Vidal Nuno will look to repeat the control he showed in his last start when he didn’t allow a run in 5.2 innings pitched. Ending their stretch of 15 consecutive games against the American League East with a win would be a lot better than the alternative. Jake Odorizzi will get the start for the Rays. David Robertson, who has had a very good season except for his appearance on June 1 where he allowed five runs, is tied for fourth in the AL with 18 saves. He has a 2.93 ERA and an outstanding ratio of 48 strikeouts to only nine walks. He has not allowed a run in his last nine appearances and has recorded multiple strikeouts in six of those games. 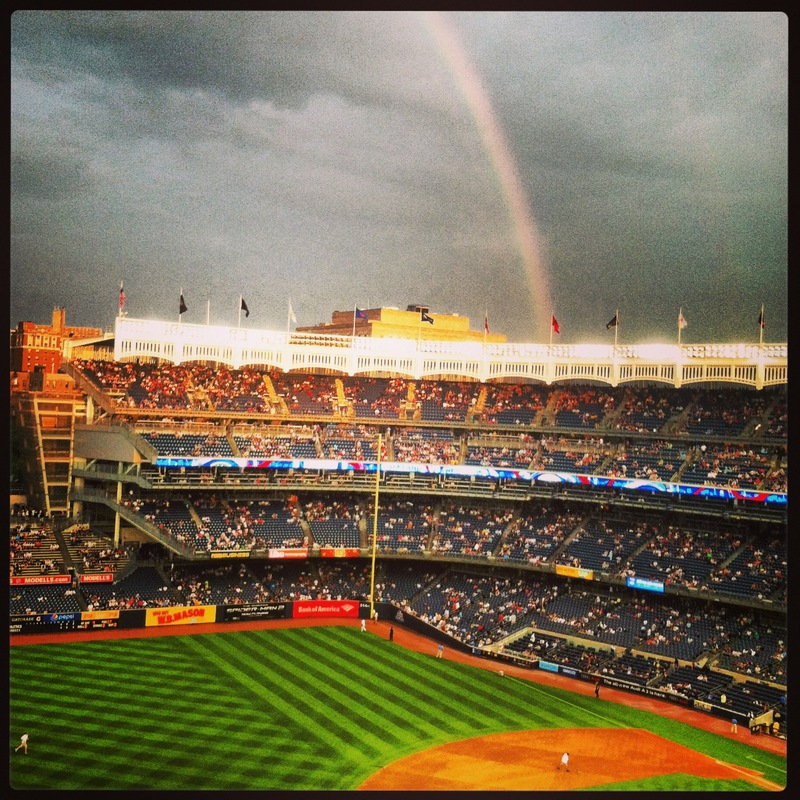 The rainbow at Yankee Stadium after the storm ended. Tuesday’s game against the Oakland Athletics was delayed 1 hour and 12 minutes because of a heavy rainstorm, but the double rainbow that was over the stadium after the rain stopped was not able to wake up the struggling offense against Scott Kazmir. They lost 5-2 in 10 innings as a result of the offense scoring two runs for the third time in their last four games. Their only win in the last five games was when they scored three runs in a win over the Twins. Mark Teixeira, who was playing in his first game since Saturday as a result his wrist keeping him out of the lineup again, drove in the two runs that the Yankees scored. His single to right in the first inning drove in Brett Gardner, and Teixeira’s 407-foot homer to left in the sixth gave the Yankees a 2-1 lead. The offense could have scored more runs but they were only 1-8 with runners in scoring position. Alfonso Soriano was 0-3 with three strikeouts while looking completely off balance at the plate. He does not have a hit in his last 15 at-bats, which has dropped his average all the way down to .226. He should get designated for assignment or at the very least not play for an extended period as a result of how he is hurting the offense. Kazmir had 10 strikeouts and allowed those two RBIs by Teixeira before being taken out of the game with one out in the seventh, but Hiroki Kuroda had his best start of the season. Kuroda threw 6.2 innings while allowing one earned run and a season-low two hits. One of them was Brandon Moss’s first of two homers. It appeared that he would get his fourth win of the season, but Dellin Betances, who has been outstanding this season, lost the lead. Betances’s strikeout to end the seventh drew a standing ovation from the crowd, but he unraveled in the eighth as he walked Albert Callaspo and gave up a game-tying RBI double to pinch hitter Stephen Vogt. Betances had previously only allowed one run in his previous nine appearances, while striking out 24 batters in those nine games, which has made him a very valuable pitcher in the bullpen for the Yankees. Vogt was playing in only his second game of the season. After David Robertson pitched a perfect ninth inning, the game went into extra innings with the score tied at two. Most of the fans had left at this point as many sections of the stadium had 10 or fewer people in them. They missed seeing the normally reliable Adam Warren gave up three earned runs in two thirds of an inning to raise his ERA from 1.71 to 2.53. Moss lead of the tenth with his second homer that would end up being the game winner, Jed Lowrie’s double passed Jacoby Ellsbury in center scored Yoenis Cespedes and Kyle Blanks’s single that scored Lowrie made the score 5-3. The two, three and four hitters came to bat in the tenth for the Yankees but they were retired in order to end the game in front of a sparsely filled Yankee Stadium. There have not been many times when there were so few people at Yankee Stadium, but the struggling offense did not give much reason for hope. The Yankees, 29-28 and third place in the AL East, will look to score more than three runs for the first time since the 7-4 win in St. Louis on May 28 when they play the second game of the series against the Athletics on Wednesday night at 7:00 p.m. Vidal Nuno, who allowed four runs in his last start, will pitch against righty Jesse Chavez (2.78 ERA). 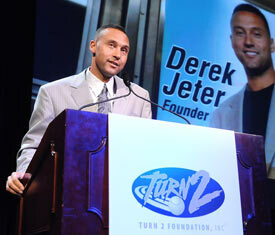 Jeter speaking at a Turn 2 Foundation event. Masahiro Tanaka bounced back very well from his first loss of the season as he only allowed one earned run on five hits in 6.2 innings pitched in the 7-1 Yankees win in the series finale against the Chicago White Sox. Tanaka’s effective splitter and slider helped him strike out six and earn his seventh win of the season. Tanaka was aware that he had to make some adjustments to improve on his last start. “I wanted the ball to go down, that is why I made some tweaks to my mechanics,” Tanaka said. The Yankees split their six games in the Windy City. They had to win their previous two games to do so, and they broke their streak of winning their previous three games by only one run. It was a good sign that the offense produced 10 hits and that Tanaka was able to go deep in the game once again to give the bullpen a break. Tanaka has now pitched at least six innings in every start this season and every start has been a quality start (six innings and three runs or less). He has struck out at least five batters in every start and has struck out at least seven hitters in eight of his 10 starts. He has an outstanding ratio of 79 strikeouts to only 10 walks in his rookie season. The Yankees scored seven runs even though their 3-5 hitters went a combined 0-11 in the game. They got contributions offensively from everyone else as Brett Gardner, Derek Jeter, Jacoby Ellsbury and Brian Roberts all drove in runs and six different players scored runs. The wind appeared to help Roberts hit his second homer of the season in the eighth, and Alfonso Soriano had his first multi-hit game (2) since May 17, but the offensive star of the game was Jeter. The Captain had four hits in five at-bats in his final game at U.S. Cellular Field. He had three singles and his first triple of the season. His four hits raised his average from .259 to .275. Jeter hit his stand up triple to deep right center past a diving Adam Eaton. He would score on a Andre Rienzo wild pitch to make the score 5-0 in the fourth. Rienzo allowed 54 pitches through two innings, which signaled that it would be a long afternoon for the White Sox. “Everybody contributed, and it was nice to see,” Girardi said after the game. If Jeter collects 74 more hits the rest of the season, which is realistic, he will finish in sixth place in the all-time hits list behind only Tris Speaker, Stan Musial, Hank Aaron, Ty Cobb and Pete Rose. Before the game, the White Sox gave gifts to Jeter just like every team is doing after Jeter plays his last game in their stadium. He received dirt from the old Comiskey Field, a bench made of baseball bats that honored other Yankees legends and a $5,000 check for his Turn 2 Foundation. Conor Gillaspie’s single that drove in Tyler Flowers in the sixth was the only run the Yankees allowed. Adam Warren and Matt Daley pitched the final 2.1 innings and they both continued to be reliable options out of the bullpen. Daley hasn’t allowed a run in his last seven appearances and Warren lowered his ERA to an impressive 1.55. The Yankees will travel south to St. Louis and start a three-game series against the Cardinals on Memorial Day. The game will start at 4:05 p.m. EST and will be televised on ESPN. Chase Whitley, who allowed one earned run in his first two starts, will pitch for the Yankees as they try for their third consecutive win. Michael Wacha, who is 12th in the National League in ERA and 6th in strikeouts, will get the start for the Cardinals. The Yankees will start their two-game series against the Cubs at Wrigley Field tonight at 8:05 p.m EST. After playing the Cubs, they will stay in Chicago to play the White Sox for four games, and then go south to St. Louis to play a three-game interleague set against the Cardinals. It is very rare that a team will play six games in a row in an away city. The Yankees begin their brief series at Wrigley Field with a half-game lead over the Baltimore Orioles for first place in the American League East. The Yankees come into the series having won four of their previous five games. The Tampa Bay Rays, who were expected to contend for first place in the division, are currently five games behind in last place. The Cubs are in last place in the National League Central and are 10.5 games behind the first place Milwaukee Brewers. However, the Cubs have won their previous two games. Masahiro Tanaka, who is 6-0 with 66 strikeouts and a 2.17 ERA, will get the start for the Yankees. The rookie is second in the AL in wins, fourth in the AL in ERA and first in the AL with a 0.97 WHIP. In his start on April 16 against the Cubs at Yankee Stadium, he pitched eight shutout innings and recorded eight strikeouts. His seven walks are also the fewest of any starting pitcher. Jason Hammel, who is Chicago’s second best starter so far this season after Jeff Samardzija, will get the start for the Cubs. Hammel has a 3.06 ERA and 43 strikeouts in 53 innings pitched. In his start last month against the Yankees, Hammel allowed three runs in seven innings, but got the loss as Tanaka did not allow any runs. Tanaka, who has not lost a regular season game since the 2012 season in Japan, seems like he is poised to go 7-0 based on the weak Cubs offense. They are currently 25th in baseball in runs scored, 27th in batting average (.234) and 27th in on-base percentage. The Yankees are currently third in baseball with a .264 batting average, ninth in on-base percentage and 10th with 188 runs scored. Yangervis Solarte has come out of nowhere to lead the team in average (.313), RBI, (24) and on-base percentage (.387). Mark Teixeria has performed very well since coming off of the disabled list. His nine homers lead the team, and he didn’t hit his first one until April 24. Tanaka is by far their most reliable starter right now with CC Sabathia, Michael Pineda and Ivan Nova all on the disabled list. 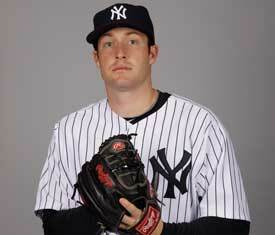 Chase Whitley, who is taking Sabathia’s spot in the rotation, will start in the second game. In his MLB debut last week against the Mets he threw 4.2 shutout innings. 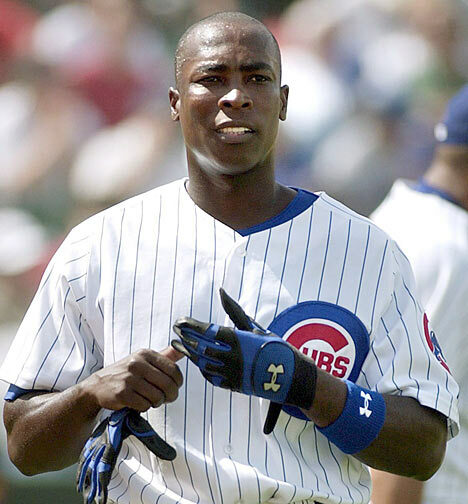 This will be Alfonso Soriano‘s first time playing back in Wrigley Field since the Cubs traded him to the Yankees on July 26 of last season. Soriano played the first six seasons of his career with the Yankees, so his career has come full circle. In Derek Jeter’s final Subway Series game, the Yankees beat the New York Mets 1-0 at Citi Field on Thursday night as Chase Whitley pitched 4.2 shutout innings innings in his major-league debut. He walked two, gave up two hits and recorded four strikeouts while helping the Yankees split the season series with the Mets. Joe Girardi could not have asked for much more from Whitley, who replaced Carlos Beltran on the active roster, and part of the reason he took him out when he did is because he knew he had Dellin Betances available to throw two innings. In seven games and six starts this season for Triple-A Scranton Whitley had a very good 2.39 ERA. David Robertson got his first save of more than one inning of the season, but Betances’s performance is the one that truly stands out. In the bottom of the sixth, Betances impressively struck out the three most powerful hitters in the Mets lineup – Daniel Murphy, David Wright and Curtis Granderson. He now has a remarkable 39 strikeouts and only nine walks in 22.1 innings pitched. The Yankees were able to score the only run of the game in the seventh as Alfonso Soriano hit a clutch two-out double to deep center to drive in McCann. Soriano was the only Yankee with two hits and now has two multi-hit games in his last five. Whitley was even able to single to right in his first career at-bat. Robertson, Adam Warren and Betances pitched out of the bullpen and they all struck out two or more batters. Betances got his second win of the season after striking out six and not allowing a hit or a walk. After Eric Young Jr. grounded out to third, Betances struck out the next six batters that he faced. Girardi likes the ability that his bullpen has to record strikeouts. “We have some power at the back end, and when you have that you are going to get strikeouts, and those are very important,” Girardi said. Pitching coach Larry Rothschild and Girardi have rightfully been showing more and more confidence in Betances, who was switched to pitching in relief last season, and he rewarded them tonight. In his two appearances before Thursday’s game, he combined to pitch 2.2 innings, allow one hit and strike out three. It seems that he is beyond his control issues that hurt him earlier in his career. “I am just trying to make pitches,” Betances said after the game. “If I can get ahead I know I can try and put some guys away. Today is one of those days that I was able to do that. I am just happy we got the win. I grew up watching the Subway Series.” Betances added that Whitley is a good friend of his and is happy he pitched well. Before the game, the Mets honored Jeter with a No. 2 mosaic designed using subway tiles and donated $22,222.22 to his Turn 2 Foundation. The Yankees (21-19), who are now a half-game behind the Baltimore Orioles in the closely contested Al East, will try for their third consecutive shutout when they start a three-game interleague series at home against the Pittsburgh Pirates on Friday at 7:05 p.m.
Yangervis Solarte scoring a run for the Yankees against the Houston Astros. The Yankees beat the Boston Red Sox 14-5 at Fenway Park on Thursday as CC Sabathia pitched six innings and allowed only two runs while striking out eight batters. He has dominated in his last two starts after struggling in his first three. Sabathia won his third game of the season and was helped by only allowing three hits. He struck out his 1,031st batter in this game, which puts him in 10th place on the Yankees all-time list. The Yankees won two of the three games in this series and have now won five of their first seven against the Red Sox. The Yankees scored runs in six different innings, had five players have two or more hits and were helped by five Red Sox errors. The Yankees were led by rookie Yangervis Solarte, who was 2-5 (to improve his average to .310), and drove in a career-high four runs. Felix Doubront did not have it for the Red Sox as he threw 73 pitches before being taken out of the game with two outs in the third. In the first inning, to give the Yankees a 1-0 lead, Alfonso Soriano’s double to deep right center scored Carlos Beltran. After a wild pitch that bounced before it got to catcher David Ross, Brian Roberts advanced to second and Brett Gardner to third with no outs in the second. Yangervis Solarte’s double that was hit just past Brock Holt at third drove in Roberts and Gardner. To make the score 4-0, Doubront’s second wild pitch of the inning sent Solarte home from third. The three runs that the Yankees scored in the second were off of only two hits. Dustin Pedroia’s error at second trying to convert a double play allowed Roberts to get to first. Mark Teixeira led off the third with his first homer of the season. His homer bounced back onto the field after just clearing the top of the Green Monster. Roberts’s single to center scored Gardner after he easily stole second and third. For the third run of the third, and seventh of the game, speed helped manufacture a run again as Jacoby Ellsbury’s single scored Roberts after he stole second. In the bottom of the fifth, Sabathia retired Boston in order. One of his two strikeouts in the inning was getting Mike Napoli to go down looking. Sabathia is figuring out how to pitch with decreased velocity. In the eighth inning, the Yankees scored their final run off of another Boston mistake. This time, Edward Mujica’s wild pitch allowed Roberts to score his fourth run of the game. In addition to Solarte, Ellsbury had three hits and three RBIs against his former team, Jeter had two hits and two RBIs, Gardner had four runs scored and two steals and Roberts and four runs scored and a RBI. After traveling back to New York, the Yankees, who are now 13-9 and in first in the AL East, will play the Los Angeles Angels on Friday night at Yankee Stadium. The Angels are 10-11. 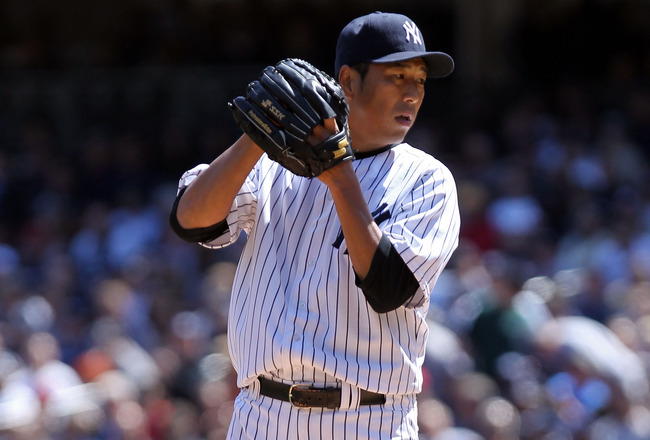 Hiroki Kuroda, after allowing three runs in 5.2 innings in his last outing, will get the start for the Yankees. C.J. Wilson will pitch for the Angels. Michael Pineda pitched his first game after the “pine tar/dirt” incident against the Red Sox, and he led the Yankees to a 2-0 win in the nightcap of the doubleheader. 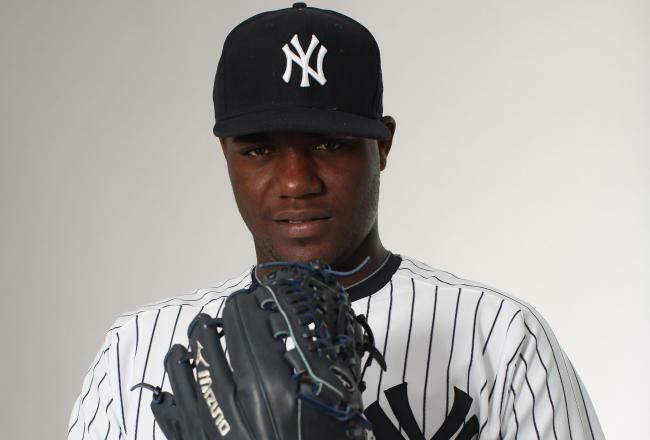 In six shutout innings, Pineda allowed four hits, had three big strikeouts and only one walk. “Today is hard because it was cold, but today my changeup was working, and I am happy about that,” Pineda said. The inning that Pineda showed the most poise and resilience was in the fifth. Starlin Castro and Luis Valbuena both singled and advanced to second and third, but Pineda was able to retire Ryan Kalish via strikeout and Darwin Barney via fly out to prevent any damage. Pineda, who is in his first season pitching after two injury-filled campaigns after being acquired from the Seattle Mariners, is pitching like when he was an All-Star as a rookie for the Mariners. After three starts, he has pitched 18 innings, has 15 strikeouts to only three walks, and a 1.00 ERA. In the first game of the doubleheader, Masahiro Tanaka’s eight dominating innings helped the Yankees win 3-0. His splitter was working as he struck out 10 batters and only allowed two hits (both bunts) and a walk. The last time the Yankees shutout both games of a doubleheader was in 1987 against the Royals, which proves this is a rare yet impressive feat. Yangervis Solarte, who came into the game tied for the league lead in doubles, was not able to drive Carlos Beltran home from third after he hustled to second after his grounder deflected off of Starlin Castro’s glove in the first. In the bottom of the third, Derek Jeter, who missed the previous three games due to a tight quad, was stranded at second after his routine grounder went right under Darwin Bailey’s glove for an error. The Yankees finally came through with runners in scoring position in the fourth. With Scott Sizemore on third, after recording his first hit as a Yankee, Brett Gardner (.283) hit a single past Anthony Rizzo at first that sent him home. For Sizemore’s first RBI as Yankee he drove in Alfonso Soriano with a shallow two-out hit to left. Sizemore, who was out of baseball due to injuries the last two seasons, went 2-3. After Soriano’s two hits he is now hitting .300 in his past five games. The bullpen only allowed two hits in three innings. Adam Warren picked up his first career save. Shawn Kelley was not available since his 22 pitches helped him record the save in Game 1. Every player wore No. 42 in honor of Jackie Robinson Day, and before the second game the Yankees dedicated a plaque in Monument Park to honor the late Nelson Mandela. The Yankees, who have now won four games in a row, will have momentum when they play in Tropicana Field against the 7-8 Rays on Thursday.